Pure Compounds Effluents Sediments Surface and Ground Waters Wastewaters. 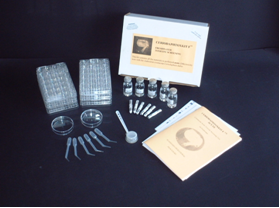 Like the Daphnia Magna and Daphnia Pulex the Ceriodaphnia toxcity testing kit contains all the materials necessary to perform six acute toxicity tests with the freshwater crustacean Ceriodaphnia dubia. The easy to follow instructions and detailed illustrations are provided in the toxicity kits for the conduct of range-finding and definitive tests. The test organisms (Ceriodaphnia dubia) are included in the kits as dormant eggs (ephippia) which can easily be hatched on demand in 80h, to supply the live biota for the conduct of the assays. • The CERIODAPHTOXKIT F toxicity test kit is a 24h assays based on mortality of the test organisms, with calculation of the 24h LC50. • Ephippia (dormant eggs) of high quality produced in strictly controlled conditions preclude variability associated with recruitment/ maintenance of live stocks in conventional bioassays. • Highly uniform quality of the test medium is achieved by simple dilution of concentrated solutions of selected salts with deionized water. • Standardized micro plate test containers constructed of biologically inert materials ensure uniform exposure conditions. • A Quality Control Test with a reference chemical is described in detail, for accuracy and reproducibility check. • Ephippia can be hatched "on demand", eliminating the need and the costs of continuous culturing and maintenance of test organisms. • Minimal equipment needed for test performance: light table or dissecting microscope - small incubator - conventional laboratory glassware. • Tubes with ephippia, concentrated hatching and toxicant dilution medium, hatching and test containers and micropipettes for the transfer of the organisms. • Detailed Standard Operational Procedure brochure, abbreviated Bench Protocol, data scoring sheets and graphical LC50 calculation sheets. • Specification sheet with batch number of the ephippia and the media. • Simple handlings and scorings. • Total performance time of the assay approximately 1 hour. • A floppy disc for easy Toxkit data treatment can be obtained on demand. • Comparable to the sensitivity of Ceriodaphnias from laboratory cultures. • Used in many laboratories, especially in the USA and Canada for routine screening of chemicals and environmental samples. • Substantial number of publications reporting data for various uses. 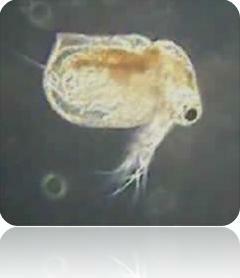 • The acute CERIODAPHTOXKIT MicroBioTests strictly adheres to the protocols for regulatory testing with Daphnia’s.